Judging by all the comments on my Facebook page, it is still very much winter in most areas of the US. It's been predominantly cold, wet, and dreary at the farm as well, so we're still in hibernation mode. Bring on the comfort food! 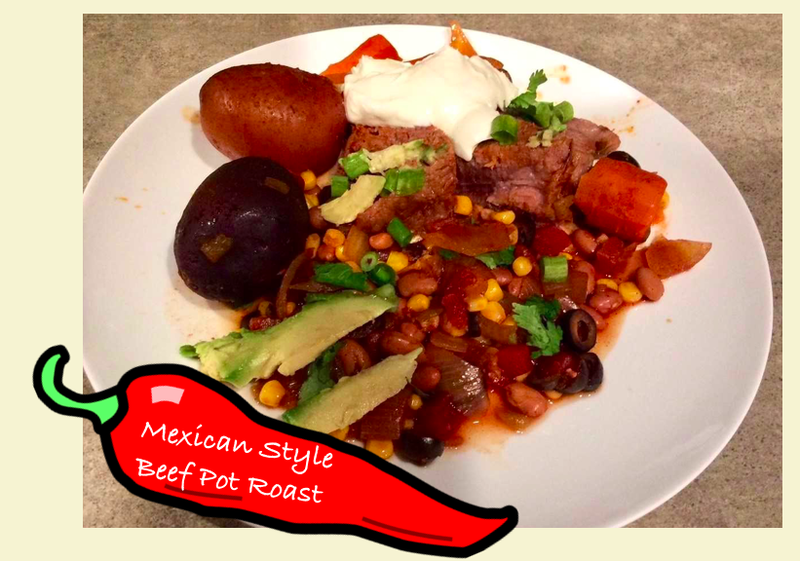 This dish, tried, tested and appropriately adjusted by Steve Made, is a delicious infusion of the classic pot roast bursting with south-of-the-border flavors. In a 6 quart crock pot pour ½ cup of the enchilada sauce to cover the bottom. Add roast and top with salt, pepper and remaining enchilada sauce. Cover and cook on high for 6 hours or until beef is tender. 2 hours into cooking process, turn over pot roast - add potatoes, onions and carrots. In the last hour of cooking add pinto beans, corn, black olives, diced tomato and green chilies. Garnish with sour cream, green onion, cilantro, sliced avocado, sliced lime and/or fresh squeezed lime juice.